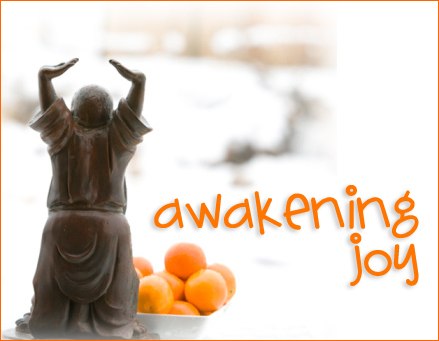 Awakening Joy has started up again. I’ve been taking the course for years and really recommend it. For those who are a little daunted by the suggested tuition: pay what you can.The suggested tuition is for those that attend the class in California, but it’s “pay what you can” for those taking the class via internet. Every year I get a little something different from the course. It’s interesting, because the material is pretty much the same every year, but the experience of the class changes SO MUCH depending on what’s going on in everyday life. Last year I wound up taking the topics from the first three months (Intention, Mindfulness, and Gratitude) and working on them for the entire year- I started daily meditation, a regular gratitude practice, and I just did that whole series on intention over at Bliss Habits. True confession: I am an obsessive note taker/underliner/information hoarder. I just can’t shake it. Whenever I take ANY kind of class, whether it be something creative or even intro to sign language at the local high school, I get a little bonkers about it. The way I have always approached Awakening Joy was to STUDY the readings, online lectures, books, and practice letters like I was studying for some major test. And after a few months of that, of trying to review and relearn everything every month, trying to create 1,000 new daily practices to make my life happier, I would completely burn out. This year, I’m just letting myself just BE THERE for the information as opposed to trying to learn it all. I’m paying careful attention, but not trying to memorize anything. There’s just *too* much. I’m just sort of seeing what themes and ideas pop out at me, which topics I want to explore more. Then I will go from there. Anyway, there are a handful of exercises every month, and I thought I might do some of them on here. The first one was sort of a doozy- it was a simple question, but as I thought about the answer, it got *HUGE* and fairly emotional. So I’m still debating how comfortable I feel sharing that here, on this blog. I know I should, but it makes me feel a little vulnerable. So I’m still weighing it out, thinking on it. That sounds like such an interesting course. I like your approach to how you are going to go about it this year. It will probably be more enjoyable for you to loosen up and find what strikes you. As for sharing, I think that’s a personal decision. I was searching for something within the last few days and found one of my journal pages in the search. My stomach did flips. I think I will be pixelating my journal entries from now on. I know logically that when I post them to my blog that they are there in the public space for anyone to read but I think part of me thinks that since I only have a small following, that only you guys are reading and it shocks me to see my pages show up somewhere else. Silly, I know. Next Post Awakening Joy: Why?